...as FIFA's Day for Friendlies approach Accra, Jan. 26, GNA - Ghana's Black Stars is still searching for an opponent for an international friendly match as FIFA's Day for international friendly matches, February 9, approaches. This follows the cancellation of a proposed friendly match between the Black Stars and an unnamed Bundesliga side in Germany on February 9. Information gathered by the GNA Sports indicates that the cancellation was necessitated because the German national team will host Argentina on the same day and this will give the proposed match for the Black Stars less attention. 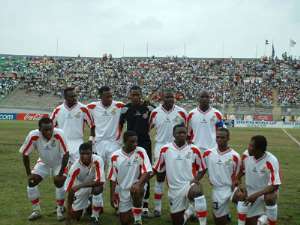 The Black Stars are to start the second round of the 2006 Africa World Cup qualifying series with an away match against Democratic Republic of Congo in March this year. Ratomir Dujkovic, head coach of the Black Stars told the GNA Sports that he is now looking forward to take up a friendly match against teams from either England or Netherlands on the said date. He said arrangements are currently being made for the proposed matches and expressed the hope that the Ghana Football Association (GFA) will succeed in getting a match for the team. Coach Dujkovic said that the Black Stars is finding it difficult in getting teams for a friendly match because of late arrangements. Meanwhile an offer from Rwanda to play the Black Stars in a friendly match on the said date has been rejected by the coach. According to coach Dujkovic, he would prefer playing a friendly in Europe because it will be more convenient for him to assemble and assess most of the country's foreign-based players. He said the match against the Rwandans would not serve the interest of the team's preparations for the crucial game against the Congolese, hence the need to play a match in Europe. Coach Dujkovic, however, said that should the team fail to get a friendly game in Europe they would be compelled to consider the offer of the Rwandans. He said a group of locally based players and some few foreign-based stars will be assembled to honour the Rwandan match.